Love what we’re doing here at FilmBar? A FilmBar membership is a great way to support our efforts and get a lot of great perks, to boot! MEMBERS! CLICK HERE TO LOG IN! We've currently got 3 levels of Membership. Read more below, then join the club! -- With each online ticket purchase, you'll earn points toward free General Admission-priced tickets! -- must renew once a year to retain points! As a FilmBar Weekday Warrior, you'll enjoy some great benefits! -- $1 off all General Admission tickets! -- 15% off all merchandise (available in-store)! The Full Monty, and then some! -- $2 off all General Admission tickets! -- 20% off all merchandise (available in-store)! -- Earn points toward free tickets with each ticket purchase! 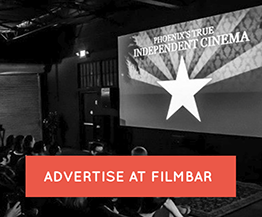 -- When possible, you'll be invited to exclusive advanced screenings for FilmBar Film Freaks! -- AND, a gift! A FilmBar Film Freaks Coffee Mug!